Sweet Fancy Treat: I'm Going Oriental. Care To Join Me? I honestly don't know what's with Japan and me. Orient in general, for that matter. It attracts me both in a pleasant but also weird way. It's a driving force. I feel, or at least pretend to, that anything coming from that world has a little something else hidden behind. An idea, a conflict, a struggle, a critic. But letting all this aside, Japan has an incredible way of expressing itself. And I'm not refering only to fashion designs. 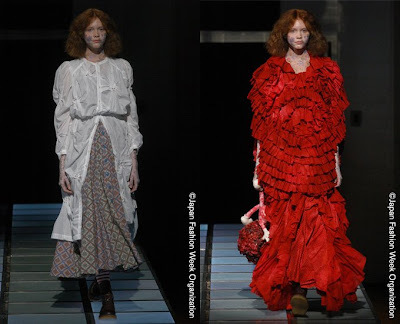 The reason I'm relating to this is because, over the last week, I've been oooh-ing and aaah-ing over the creations presented on the catwalk during the Japan Fashion Week. Also, understanding the oriental style can be quite a challenge for outsiders. if you haven't been brought up in such an environment, or at least spent a significant amount of time in that geographical area, it's nearly impossible to get the sense of Japan. To feel it, to taste it, because it truly is something that is delicious in any way you look at it. Japan is a relatively new force in the world. Its rise, be it economical, technological or social has truly started only beggining with the 19th century. Since then Japan is constantly being one of the major powers in the world and has quite a word to say when it comes to important decisions to be taken. 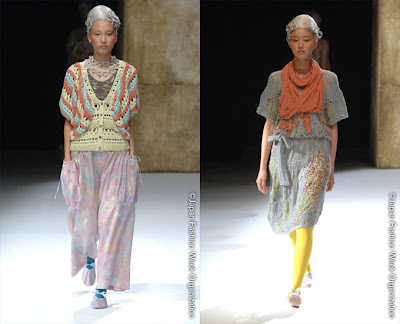 Did you know that Japan Fashion Week has been organised only starting with 2005? Well, yes. 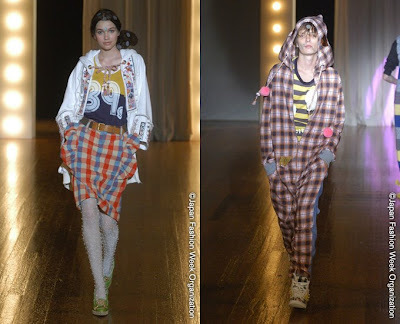 It was that year the CFD (Council of Fashion Designers, Tokyo) had the 20 years anniversary. 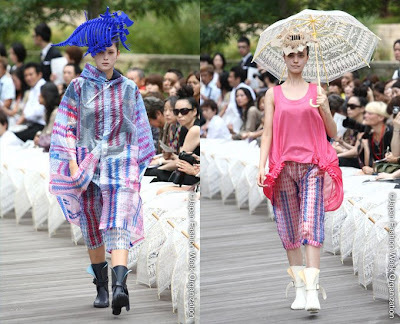 The Tokyo Collection had been organised until then, but designers and manufactureres decided it was time to concentrate venues and shorten the lenght of the program. This is how the Fashion Strategy Forum appeared. Under this forum, the JFW in TOKYO was launched. Even thought it's only on the forth year, the creations are stunning. I'm talking pastels, rivers of colors, mountains of ruffles, volumes, laced umbrellas, excentricity and all things cupcake-like. Besides this, I love Japanese models. Especially because of their faces. They seem unreal and they give clothing a different meaning. Also, I love when typical Occidental or American traits are mixed with tradition. Meaning pink and violet hair, piercing, sneakers of all kinds and a whole lot of mix and match. Just a quick eye on any Japanese street-style site, and you'll know what I mean. But I'm divagating. 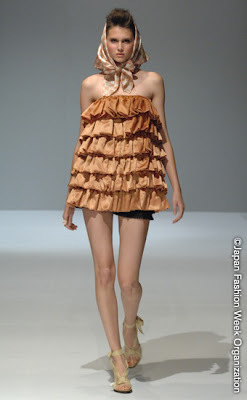 Going back to JFW, this year the 7th edition of JFW is taking place. What I find particualry remarcable is the fact that the Japanese government and private sector are collaborating to achieve three main goals. These are: increasing Tokyo's reputation in the fashion world, developing cooperative ties between those in the branch and the collaboration with local communities. Everlasting Sprout S/S 09 See?